Congratulations! 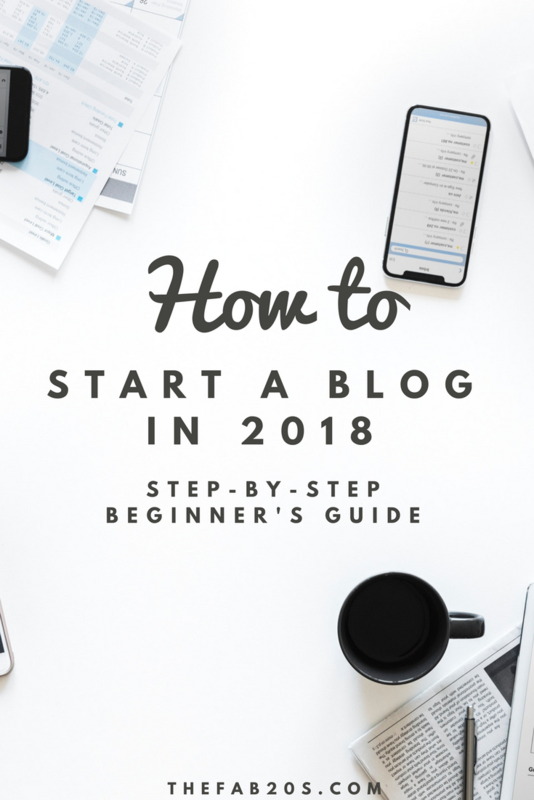 If you’re reading this, I can only assume you are taking your first steps on your blogging journey. How exciting! I remember when I first wanted to start a blog. The idea for TheFab20s kind of just hit me out of the blue, but then I just sat with it for TWO WHOLE YEARS. I felt like I had such a great idea, but I was completely paralyzed. There is so much information online about how to go about it. Chances are, you probably are too. So take a deep breath and lets break it all down, step-by-step. You can do this! Is it for passion, community, money? Honestly, my blog has been one of my most rewarding, uplifting, frustrating experiences of my life. For me, (beyond the money and financial freedom) this blog is creative outlet, a way to meet interesting, like-minded individuals, and it’s also become a self improvement journey. My writing skills have greatly improved in the last year. Also, I’ve learned a lot of skills I didn’t have before, like graphic design. Also, no matter what you’re interested in, whether it’s business, movies, DIY, organization, knitting, parenting, music, anything – I assure you, there is someone out there that would enjoy reading your posts and thoughts. My one recommendation if your main goal when it comes to blogging is money (and I know all the gurusout there will scream at me for this), the riches are NOT in the niches – Blogging gurus tell you to get very specific about a topic, and that makes sense if you’re an expert in a certain field, or incredibly passionate about one topic. But the internet is a very big place! Why are you going fishing with such a narrow net? The wider the net, the greater chances of generating traffic. Some people come to my blog for the money posts and don’t care for the travel, and vice-versa. I think that’s great! I am always generating traffic because there a little something for everyone here. Clarification: You should have a niche, but don’t micro niche. For example, my niche is ‘Woman in their 20’s’ which can encompass a wide range of topics. It isn’t ‘Single 26 year old moms with 2 kids and a part-time job a Macy’s.” Pick a Niche, but keep it wide and go fishing! Later on you’ll see what articles and topics your readers truly love and can make adjustments as necessary. This step is where a lot of people freeze up. My recommendation is to write down a couple of words (around 15-30) of what your blog will be about. Just jot it down. I t can be related to your topic, or how you want your blog to feel, use your own name if you want. Once you have your list, I recommend checking that all the socials are available of that name. I use this site to check if they’re available. Although you probably won’t use all forms of social media (I actually recommend on focusing on just one when you’re starting out), it’s good to reserve the names and have them available. Check that your name isn’t taken on facebook, instagram, twitter, and pinterest – even if you don’t think you’ll use it. I reserved all my names, even though I mostly only ever use Pinterest. Quick note on the name : although a name is important, don’t sweat it so much. What’s much more important is the content you’ll post on the site. I would keep the name short and easy to remember. Also, check to make sure you aren’t picking a name that’s trademarked by someone (check here www.uspto.gov/trademarks ) . Although you might love HaleysSweetDesserts.com, it’s very likely readers will forget or might even misspell the domain and land on an incorrect page. While SweetHaley.com is much more easily remembered and alludes to the meaning of the blog without pigeonholing you. Try to keep the name under 12 characters! Don’t overcomplicate it! I know some bloggers spend months (yes, months!!) deciding on a name. Chances are, you’re paralyzed because you’re a perfectionist of some sort and don’t want to make a mistake. You will make a lot of mistakes blogging, but just choosing a name and moving on won’t be one of them. I have seen plenty of phenomenal blogs with some pretty meh names. Nobody cares about your blog name as much as you. Just make sure YOU like it. That’s the most important thing. You’re going to need to decide on a reliable hosting platform. And yes, I 100% recommend a self-hosted site. If you don’t self-host, it means your site would look like this www.thefab20s.blogger.com. Technically, anything you write on a free site like that isn’t yours. It’s owned by blogger.com (or whatever site you use). Also, if you ever decide to monetize your site, it will be really hard (if not impossible) and brands tend to not want to work with sites like these. Also, when you self-host, ensure you use WordPress.org. The free option, WordPress.com does not allow monetization via advertising or sponsorships of any type. Now, there are plenty of hosting sites available. For this tutorial, I will walk you through setting up your BlueHost site. 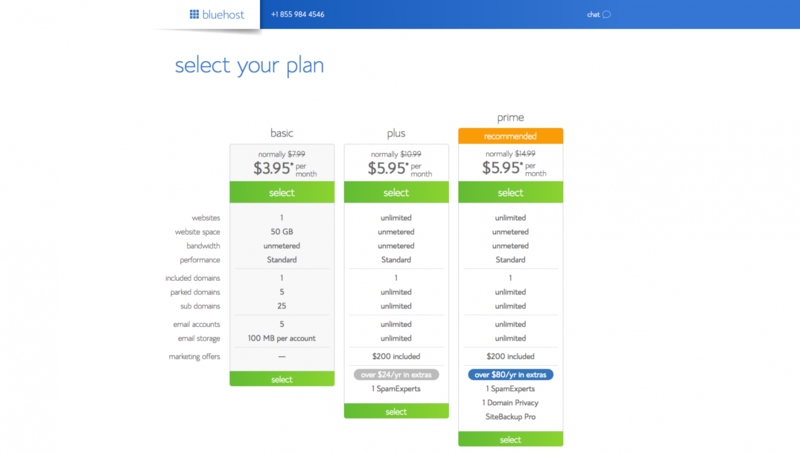 For the sake of this tutorial, I’ll walk you through setting up your account with Bluehost. The Basic plan is best for the majority of people starting out, they do offer Plus and Pro with some better features and upgrades at an additional cost, but I used the Basic plan for over a year and genuinely don’t think you need the fancier options in the beginning. Once you get over 200k monthly views on your site, you can upgrade and at that point it will be worth it since you’ll be making money. But right now, it’s best to stick to a budget. If you are using the free domain name you get when you sign up with BlueHost then your domain will already be linked to your account. That’s one less thing you have to worry about.. I highly recommend doing everything with Bluehost as connecting a domain from sites like Godaddy can sometimes be a hassle if you’re just starting out. If you purchased your domain on Godaddy then head on over to this page that will walk you through the steps. 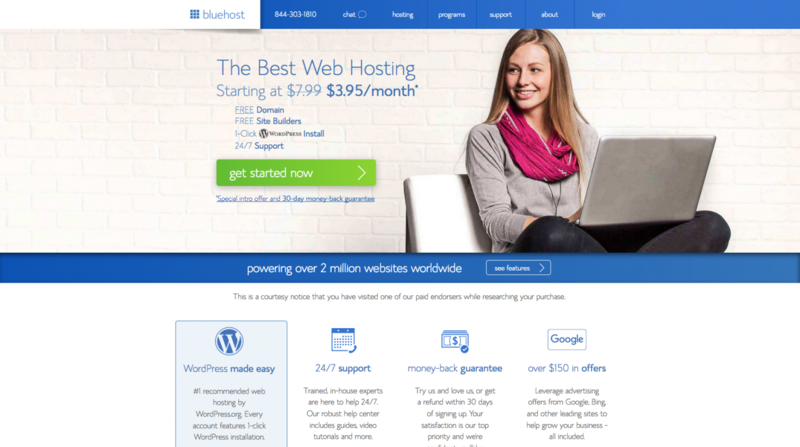 Another amazing benefit of BlueHost is you actually don’t have to install wordpress. They currently have a Bluerock sign up process which comes with wordpress pre-installed! How cool is that?! Congratulations!! You are officially a blog owner! Now just take things one step at a time as you play around with your style of writing, photography, etc. I love CreativeMarket! They have so many options and the prices are very reasonable. 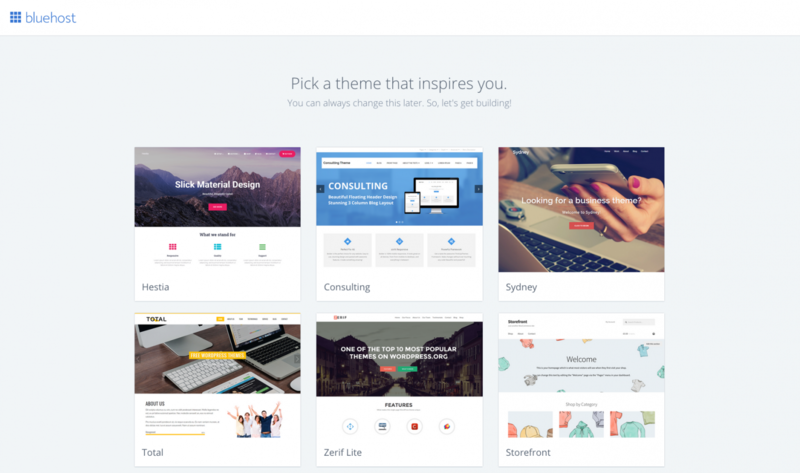 Just make sure you pick a theme that has good reviews and is responsive! In the beginning, I only recommend you stick to one social media platform : PINTEREST. Its the one that will skyrocket your site.